Maria Tumarkin travels with her Australian-born teenage daughter, Billie, back to Russia and Ukraine to have her experience first-hand the seismic shifts of her family’s native country. For Maria the trip back is no simple stroll down memory lane. Splintered and scattered across the world, her generation has ended up inhabiting vastly different realities. Along with exploring the political and cultural fallout of a century of turmoil, Maria wanted to bring together the worlds of her mother and daughter – the different continents, histories and experiences they encompassed. Before they set off, Maria wistfully imagined her and Billie’s hearts beating in unison as they travelled back to a past they could both understand, forging a nearly superhuman bond along the way. But, in Maria and Billie’s case, the past was not simply another country, but one that no longer existed. 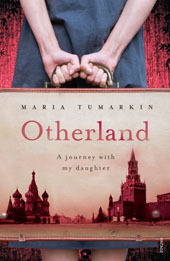 Otherland is the story of a six-week trip traversing three generations, three lifetimes and three profoundly different but profoundly interconnected stories of mothers and daughters.